Lillian Evelyn Moller Gilbreth (May 24, 1878 – January 2, 1972) was an American psychologist, industrial engineer, consultant, and educator who was an early pioneer in applying psychology to time-and-motion studies. She was described in the 1940s as "a genius in the art of living." Gilbreth, one of the first female engineers to earn a Ph.D., is considered to be the first industrial/organizational psychologist. She and her husband, Frank Bunker Gilbreth, were efficiency experts who contributed to the study of industrial engineering, especially in the areas of motion study and human factors. Cheaper by the Dozen (1948) and Belles on Their Toes (1950), written by two of their children (Ernestine and Frank Jr.) tell the story of their family life and describe how time-and-motion studies were applied to the organization and daily activities of their large family. Both books were later made into feature films. Lillie Evelyn Moller was born in Oakland, California, on May 24, 1878, to Annie (Delger) and William Moller, a builder's supply merchant. She was the second of the family's eleven children. Both of her wealthy parents were of German descent. Educated at home until the age of nine, Moller began formal schooling in the first grade at a public elementary school and was rapidly promoted through the grade levels. She was elected vice president of her senior class at Oakland High School and graduated with exemplary grades in May 1896. Moller, who changed her name to Lillian during college, continued her education at the University of California, Berkeley, commuting by streetcar from her parents' Oakland home. She graduated from the university in 1900, earning a teaching certificate and a bachelor's degree in English literature, and was the school's first female commencement speaker at the university. Moller enrolled at Columbia University, intending to pursue a master's degree in literature and to study with Brander Matthews, a well-known writer and educator, but soon realized he did not allow women to study with him or attend his lectures. Following her exposure to Edward Thorndike's psychology courses, she turned to Thorndike and the study of psychology because he did accept female students. After Moller became ill and returned home, she completed a master's degree in literature at the University of California, Berkeley, in 1902. The topic of her thesis was Ben Jonson's play Bartholomew Fair. Moller began studies for a Ph.D. at the University of California, but took time off to travel in Europe in the spring of 1903. Following her marriage to Frank Bunker Gilbreth in 1904 and relocation to New York, she completed a dissertation for a doctorate from the University of California, Berkeley, in 1911, but was not awarded the degree due to her noncompliance with residency requirements for doctoral candidates. The dissertation was published as The Psychology of Management: The Function of the Mind in Determining, Teaching and Installing Methods of Least Waste in 1914. After the Gilbreths relocated their family to Providence, Rhode Island, Lillian enrolled at Brown University. She earned a Ph.D. in applied psychology in 1915, which made her the first of the pioneers of industrial management to have a doctorate. The topic of her dissertation was efficient teaching methods and titled Some Aspects of Eliminating Waste in Teaching. Lillian Moller met Frank Bunker Gilbreth in June 1903 in Boston, Massachusetts, en route to Europe with her chaperone, who was Frank's cousin. He had apprenticed in several building trades in the East and established a contracting business with offices in Boston, New York, and London. The couple married on October 19, 1904, in Oakland, California, and settled in New York. They later moved to Providence, Rhode Island, and eventually relocated their family to Montclair, New Jersey. After Frank unexpectedly died of a heart attack on June 14, 1924, Lillian never remarried. Anne M. Gilbreth (September 9, 1905 – February 16, 1987) (age 81); married Robert E. Barney; three children (Peter, Frank, and Robert). Mary Elizabeth Gilbreth (December 13, 1906 – January 31, 1912) (age 5); died of diphtheria. Ernestine Gilbreth (April 5, 1908 – November 4, 2006) (age 98); married Charles E. Carey; two children (Charles E. Carey, Lillian Barley). Martha B. Gilbreth (November 5, 1909 – November 15, 1968) (age 59); married Richard E. Tallman; four children (Janet, Blair, Mary, and Stephanie). Frank Bunker Gilbreth, Jr. (March 17, 1911 – February 18, 2001) (age 89); married 1): Elizabeth Cauthen (1934–1954) (her death) 2): Mary Pringle Manigault (1955–2001) (his death); three children (one from first marriage: Betsy; two from second marriage: Rebecca, Dr. Edward Gilbreth). William Gilbreth (December 18, 1912 – April 14, 1990) (age 77); married Jean Irvin; two children (Lillian and Bill). Lillian M. Gilbreth jr. (June 17, 1914 – June 23, 2001) (age 87); married Donald Dodge Johnson; two children (Julia and Dodge). Infant Girl Gilbreth (September 13, 1915 – September 13, 1915) (still-born). Frederick M. Gilbreth (August 17, 1916 – November 30, 2015) (age 99); married Jessie Blair Tallman; three children (Susan Kaseler, Frank, and John). Daniel Bunker Gilbreth (September 17, 1917 – June 13, 2006) (age 88); married Irene Jensen; three children (David Gilbreth, Danny Gilbreth, and Peggy). John M. Gilbreth (May 29, 1919 – December 25, 2002) (age 83); married Dorothy Girvan; three children (Peter, James, and Deborah). Jane Moller Gilbreth (June 22, 1922 – January 10, 2006) (age 83); married George Paul Heppes; two children (Laurie and Paula). In addition to jointly running Gilbreth, Incorporated, their business and engineering consulting firm, Lillian and Frank wrote numerous publications as sole authors, as well as co-authoring multiple books and more than fifty papers on a variety of scientific topics. However, in their joint publications Lillian was not always named as a co-author, possibly due to publishers' concerns about a female writer. Although her credentials included a doctorate in psychology, she is less frequently credited in their joint publications than her husband, who did not attend college. The Gilbreths were certain that the revolutionary ideas of Frederick Winslow Taylor would be neither easy to implement nor sufficient; their implementation would require hard work by engineers and psychologists to make them successful. The Gilbreths also believed that scientific management as formulated by Taylor fell short when it came to managing the human element on the shop floor. The Gilbreths helped formulate a constructive critique of Taylorism; this critique had the support of other successful managers. See also: Time and motion study and Gilbreth, Inc.
Gilbreth and her husband were equal partners in the engineering and management consulting firm of Gilbreth, Incorporated. She continued to lead the company for decades after his death in 1924. The Gilbreths, both pioneers in scientific management, were especially adept at performing time-and-motion studies. They named their methodology the Gilbreth System and used the slogan, "The One Best Way to Do Work," to promote it. The Gilbreths also developed a new technique for their studies that used a motion-picture camera to record work processes. These filmed observations enabled the Gilbreths to redesign machinery to better suit workers' movements to improve efficiency and reduce fatigue. Their research on fatigue study was a forerunner to ergonomics. In addition, the Gilbreths applied a human approach to scientific management to develop innovations in workplace efficiency, such as improved lighting and regular breaks, as well as ideas for workplace psychological well-being, such as suggestion boxes and free books. Gilbreth collaborated with her husband until his death in 1924. Afterwards, she continued to research, write, and teach, in addition to consulting with businesses and manufacturers. She also participated in professional organizations such as the American Society of Mechanical Engineers until her own death nearly fifty years later in 1972. In addition, Gilbreth turned her attention to the home, despite her aversion to housework and the fact that she had long employed full-time household help. Her children once described her kitchen as a "model of inefficiency." Due to discrimination within the engineering community, Gilbreth shifted her efforts toward research projects in the female-friendly arena of domestic management and home economics. She applied the principles of scientific management to household tasks and "sought to provide women with shorter, simpler, and easier ways of doing housework to enable them to seek paid employment outside the home." The Gilbreth children often took part in the experiments. In addition, Gilbreth was instrumental in the development of the modern kitchen, creating the "work triangle" and linear-kitchen layouts that are often used today. She is also credited with the invention of the foot-pedal trash can, adding shelves to the inside of refrigerator doors (including the butter tray and egg keeper), and wall-light switches, all now standard. Gilbreth filed numerous patents for her designs, including one to improve the electric can opener and another for a wastewater hose for washing machines. When Gilbreth was an industrial engineer working at General Electric, she "interviewed over 4,000 women to design the proper height for stoves, sinks, and other kitchen fixtures as she worked on improving kitchen designs". Lou Hoover urged Gilbreth to join the Girl Scouts as a consultant in 1929. She remained active in the organization for more than twenty years, becoming a member of its board of directors. During the Great Depression President Hoover appointed Gilbreth to the Organization on Unemployment Relief as head of the "Share the Work" program. In 1930, under the Hoover administration, she headed the women's section of the President's Emergency Committee for Employment and helped to gain the cooperation of women's groups for reducing unemployment. During World War II Gilbreth continued advising governmental groups and also provided expertise on education and labor issues (especially women in the workforce) for organizations such as the War Manpower Commission, the Office of War Information, and the U.S. Navy. In her later years, Gilbreth served on the Chemical Warfare Board and on Harry Truman's Civil Defense Advisory Council. During the Korean War she served on the Defense Advisory Committee on Women in the Services. Gilbreth had a lifelong interest in teaching and education. As an undergraduate at the University of California, Berkeley, she took enough education courses to earn a teacher's certificate, and her doctoral dissertation at Brown University was on efficient teaching methods. While residing in Providence, Rhode Island, Gilbreth and her husband taught free, two-week-long summer schools in scientific management from 1913 to 1916. The Gilbreths also discussed teaching the Gilbreth System of time-and-motion study to members of industry, but it was not until after her husband's death in 1924 that she created a formal motion-study course. Gilbreth presented this idea at the First Prague International Management Congress in Prague on July 1924. Her first course began in January 1925. Gilbreth's classes offered to "prepare a member of an organization, who has adequate training both in scientific method and in plant problems, to take charge of Motion Study work in that organization." Coursework included laboratory projects and field trips to private firms to witness the application of scientific management. She ran a total of seven motion study courses out of her home in Montclair, New Jersey until 1930. To earn additional income to support her large family, Gilbreth delivered numerous addresses to business and industry gatherings, as well as on college and university campuses such as Harvard, Yale, Colgate, the University of Michigan, MIT, Stanford, and Purdue University. In 1925 she succeeded her husband as a visiting lecturer at Purdue, where he had been delivering annual lectures. In 1935 she became a professor of management at Purdue's School of Mechanical Engineering, and the country's first female engineering professor. She was promoted to a full professor at Purdue in 1940. Gilbreth divided her time between Purdue's departments of industrial engineering, industrial psychology, home economics, and the dean's office, where she consulted on careers for women. In cooperation with Marvin Mundel, Gilbreth established and supervised a time-and-motion-study laboratory at Purdue's School of Industrial Engineering. She also demonstrated how time-and-motion studies could be used in agricultural studies and later transferred motion-study techniques to the home economics department under the banner of "work simplification". Gilbreth retired from Purdue's faculty in 1948. After Gilbreth's retirement from Purdue, she continued to travel and deliver lectures. She also taught at several other colleges and universities, and became head of the Newark College of Engineering in 1941. Gilbreth was appointed the Knapp Visiting Professor at the University of Wisconsin's School of Engineering in 1955. She also taught at Bryn Mawr College and Rutgers University. In 1964, at the age of eighty-six, Gilbreth became resident lecturer at Massachusetts Institute of Technology. In 1968, when her health finally began to fail, Gilbreth retired from her active public life and eventually entered a nursing home. Gilbreth died of a stroke on January 2, 1972, in Phoenix, Arizona at the age of ninety-three. Her ashes were scattered at sea. Gilbreth was best known for her work as an industrial engineer and a pioneer in the field of management theory. Dubbed "America's first lady of engineering," she brought her training in psychology to time-and-motion studies and demonstrated how companies and industries could improve their management techniques, efficiency, and productivity. Gilbreth's extensive research and writings on her own and in collaboration with her husband emphasized "the human element in scientific management." Her expertise and major contribution to the field of scientific management was integrating the psychological and mental processes with the time-and-motion studies. She also helped make these types of studies widely accepted. In addition, Gilbreth was among the first to establish industrial engineering curricula in college and university engineering schools. Gilbreth's book, The Psychology of Management (1914), was an early major work in the history of engineering thought and the first to combine psychology with elements of management theory. Major repositories of Gilbreth materials are at the Archives Center of the Smithsonian National Museum of American History in Washington, D.C., and at Purdue University Library, Archives and Special Collections, at West Lafayette, Indiana. Gilbreth also made contributions on behalf of women. Her pioneering work in industrial engineering influenced women in the field. In addition to her lectures on various engineering topics, she encouraged women to study industrial engineering and management. Purdue awarded its first Ph.D. in engineering to a woman in 1950, two years after Gilbreth retired from the university. Several engineering awards have been named in Gilbreth's honor. The National Academy of Engineering established the Lillian M. Gilbreth Lectureships in 2001 to recognize outstanding young American engineers. The highest honor bestowed by the Institute of Industrial Engineers is the Frank and Lillian Gilbreth Industrial Engineering Award for "those who have distinguished themselves through contributions to the welfare of mankind in the field of industrial engineering". The Lillian M. Gilbreth Distinguished Professor award at Purdue University is bestowed on a member of the industrial engineering department. The Society of Women Engineers awards the Lillian Moller Gilbreth Memorial Scholarship to female engineering undergraduates. Two of the Gilbreth children also paid tribute to their mother in books about their family life. Cheaper by the Dozen (1948), a bestseller by Gilbreth's son, Frank Jr., and daughter, Ernestine, was made into a motion picture in 1950 starring Myrna Loy as Lillian and Clifton Webb as Frank. The book's sequel, Belles on Their Toes (1950), also written by Frank Jr. and Ernestine, was made into a motion picture sequel in 1952. Frank Jr. also paid tribute to his mother in Time Out for Happiness (1972). In 2018, the College of Engineering at Purdue University established the prestigious Lillian Gilbreth Postdoctoral Fellowship Program to attract and prepare outstanding individuals with recently awarded PhDs for a career in engineering academia through interdisciplinary research, training, and professional development. Gilbreth received numerous awards and honors for her contributions. Gilbreth is the recipient of twenty-three honorary degrees from such schools as Rutgers University, Princeton University, Brown University, Smith College, and the University of Michigan. Her portrait hangs in the National Portrait Gallery. The Gilbreth Engineering Library at Purdue University is named in honor of Lillian and Frank Gilbreth. In 1921 Lillian Gilbreth was the second person to be named an honorary member of the American Society of Industrial Engineers. She joined the British Women’s Engineering Society in 1924. Gilbreth was accepted to the membership of the American Society of Mechanical Engineers in 1926, becoming its second female member. In 1931 she received the first Gilbreth Medal, which was initiated in honor of her late husband. In 1941 the Purdue University chapter of Mortar Board, a national honor society, named Gilbreth an honorary member. In 1944 the American Society of Mechanical Engineers awarded Gilbreth and her husband (posthumously) the Henry Laurence Gantt Medal for their contributions to industrial engineering. In 1950 Gilbreth became the first honorary member of the newly created Society of Women Engineers. In 1951 she was awarded the Wallace Clark Award. The University of California's alumni association named Gilbreth the 1954 Alumna of the Year. In 1965 Gilbreth became the first woman elected to the National Academy of Engineering. In 1966 Gilbreth became the first woman to receive the Hoover Medal. She was made an honorary Member of the British Women’s Engineering Society in 1967. Gilbreth was a recipient of Gold Medal award from the National Institute of Social Sciences. In 1995, Gilbreth was inducted into the National Women's Hall of Fame. ^ a b Lancaster, Jane (2004). Making Time: Lillian Moller Gilbreth, A Life Beyond "Cheaper by the Dozen". Northeastern University Press. p. 21. ISBN 978-1-55553-612-1. .
^ Carol Kennedy (2007-01-01). Guide to the Management Gurus. Random House Business. ISBN 9781905211029. OCLC 655247876. ^ a b David Ferguson. "That Most Famous Dozen". The Gilbreth Network. Retrieved 2015-09-23. ^ Lancaster (2004), pp. 38–39. ^ Lancaster (2004), p. 41. ^ Lancaster (2004), p. 46. ^ Lancaster (2004), p. 50. ^ a b c d e Held, Lisa (2010). A. Rutherford (ed.). "Profile of Lillian Gilbreth". Psychology's Feminist Voices Multimedia Internet Archive. Retrieved 2017-07-15. ^ Lancaster (2004), p. 55. ^ Lancaster (2004), p. 57. ^ Wood, Michael C. (2003). Frank and Lillian Gilbreth. Critical Evaluations in Business and Management. 1. Routledge. p. 125. ISBN 978-0-415-30946-2. ^ Lancaster (2004), p. 125. ^ a b c d e Gugin and St. Clair, eds., p. 132. ^ Lancaster (2004), pp. 157–159. ^ Lancaster (2004), p. 363. ^ Weber, Catherine E. Forrest (Summer 1997). "Dr. Lillian Gilbreth and the One Best Way". Traces of Indiana and Midwestern History. Indianapolis: Indiana Historical Society. 9 (3): 40. ^ a b c Weber, p. 42. ^ Saxon, Wolfgang (2001-02-20). "Frank Gilbreth Jr., 89, Author Of 'Cheaper by the Dozen'". The New York Times. Retrieved 2008-07-09. Frank Bunker Gilbreth Jr., a journalist whose life-with-father memoir Cheaper by the Dozen became a best seller and a popular movie of the same title, died on Sunday in Charleston, S.C., where he had lived for the last 50 years. He was 89 and also had a home in Nantucket, Mass. ^ "Gilbreth Family Tree". Cheaper and Belles. Retrieved 2011-04-18. ^ Leimbach, Dulcie (2006-11-06). "Ernestine Gilbreth Carey, 98, Author of Childhood Memoir, Dies". New York Times. Retrieved 2011-04-18. ^ "In Memory Frank B. Gilbreth, Jr. 1911-2001". The Gilbreth Network. Retrieved 2011-04-18. ^ "Frederick M. Gilbreth Obituary". Archived from the original on 2015-12-08. Retrieved 2015-12-01. ^ "Mrs. Frederick (Jessie Blair) Gilbreth". Larchmont Gazette. Retrieved 2011-04-18. ^ "Cheaper By The Dozen - The Dozen". eRead Me Vegas. Retrieved 2011-04-18. ^ "Robert Moller Gilbreth". Wilkinson-Beane Funeral Home. Archived from the original on 2011-07-18. Retrieved 2011-04-18. ^ Kass-Simon and Farnes, eds., pp. 157, 163–64. ^ Graham, Laurel D. (1998). Managing On Her Own: Dr. Lillian Gilbreth and Women's Work in the Interwar Era. Norcross, Georgia: Engineering and Management Press. pp. 49 and 54. ISBN 978-0-89806-185-7. ^ Hartness, James (1912). The Human Factor in Works Management. New York and London: McGraw-Hill. p. 159 pages. Republished in 1974. See: Hartness, James (1974). The Human Factor in Works Management. Hive management history series. 46edition =. Easton, Pennsylvania: Hive Publishing Company. ISBN 978-0879600471. ). ^ a b Weber, pp. 40–41. ^ Dempsey, P.G. (2006). "Scientific Management Influences on Ergonomic Analysis Techniques". In Waldemar Karwowski (ed.). International Encyclopedia of Ergonomics and Human Factors. 3 (2nd ed.). CRC Press. pp. 3354–3356. ISBN 978-0-415-30430-6. ^ Gugin and St. Clair, eds., pp. 131–32. ^ a b c d Graham, Laurel D. (1999). "Domesticating Efficiency: Lillian Gilbreth's Scientific Management of Homemakers, 1924-1930". Signs. 24 (3): 633–675. doi:10.1086/495368. JSTOR 3175321. ^ Kass-Simon and Farnes, eds., pp. 157–59, 161, 163. ^ De Léon, Michael A. (2000). Angela M. Howard and Frances M. Kavenik (ed.). Handbook of American Women's History (Second ed.). Thousand Oaks, California: Sage Publications. p. 220. ISBN 0761916350. ^ a b Lange, Alexandra (2012-10-25). "The Woman Who Invented the Kitchen". Slate. ISSN 1091-2339. Retrieved 2016-09-20. ^ Giges, Nancy (May 2012). "The American Society of Mechanical Engineers". Lillian Moller Gilbreth. Retrieved 2016-09-20. ^ "Report of Gilbreth, Inc.: The perfect menstrual pad, January 1, 1927". Museum of Menstruation. Retrieved 2011-04-16. ^ Graham (1998), p. 218. ^ "Planned Motion in the Home," The Gilbreth Management Desk pamphlet, N-File, Gilbreth Collection at Purdue University, as cited in Graham (1998), p. 188. ^ Altrusa International New York Club. "History". altrusanewyorkcity.tripod.com. Retrieved 2019-04-01. ^ Gilbreth, Frank B.; Carey, Ernestine Gilbreth. Belles On Their Toes. HarperCollins. p. 181. ISBN 978-0-06-059823-5. ^ Lancaster (2004), p. 273. ^ Lancaster (2004), p. 281. ^ Weber, pp. 41, 43. ^ Lancaster (2004), p. 286. ^ Wood (2003), p. 128. ^ Lancaster (2004), p. 315. ^ Lancaster (2004), p. 309. ^ Rabinowitch, Eugene, ed. (September 1951). "CD appropriations face further cut". Bulletin of the Atomic Scientists. Educational Foundation for Nuclear Science, Inc. 7 (9): 285. ISSN 0096-3402. ^ Morden, Betty J. (1990). The History of the Women's Army Corps, 1945–1978. Washington, D.C.: Government Printing Office. p. 72. ^ Lancaster (2004), p. 47. ^ Lancaster, Jane (2015-12-01). Making Time: Lillian Moller Gilbreth -- A Life Beyond "Cheaper by the Dozen". Northeastern University Press. ISBN 978-1-55553-861-3. ^ Lancaster (2004), p. 140. ^ Lillian Moller Gilbreth, typescript of an advertisement for Gilbreth, Inc., c.134 f. 0830-20, N-File, Gilbreth Collection at Purdue University, as cited in Graham (1998), p. 96. ^ Graham (1998), pp. 100. ^ Graham (1998), p. 104. ^ a b c Kass-Simon and Farnes, eds., p. 158. ^ Graham (1998), p. 234. ^ Graham (1998), p. 236. ^ a b Gugin and St. Clair, eds., pp. 132–33. 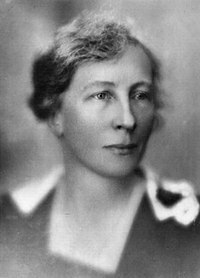 ^ "Want to Learn More About Pioneering Female Engineer Lillian Gilbreth, Subject of the Once-Again Rising Best-Seller, Cheaper by the Dozen?". New Jersey Institute of Technology. 2004-02-13. ^ Lancaster (2004), p. 339. ^ Kimble, Gregory A.; Boneau, C.; Wertheimer, Alan Michael (1996). Portraits of Pioneers in Psychology. 2. Psychology Press. p. 113. ISBN 978-0-8058-2198-7. ^ a b c d e f g h Weber, p. 45. ^ "Dr. Lillian Gilbreth Dies". Associated Press. January 3, 1972. Retrieved 2008-07-09. The real-life mother in the book and movie. 'Cheaper by the Dozen,' Dr. Lillian Moller Gilbreth, died Sunday at a local nursing home. She was 93. ^ eboss (2008-10-07). "Dr. Lillian Evelyn Moller Gilbreth". Find A Grave. Retrieved 2018-03-15. ^ Kass-Simon and Farnes, eds., p. 157. ^ Kass-Simon and Farnes, eds., p. 163. ^ Kass-Simon and Farnes, eds., pp. pp. 157–59 and 160–61. ^ "Frank and Lillian Gilbreth Collection, 1907–2000". Smithsonian Institution Research Information System. Retrieved 2011-04-16. ^ "The Frank and Lillian Gilbreth Papers". Purdue University. Retrieved 2018-03-12. See also: "The Frank and Lillian Gilbreth Library of Management Research and Professional Papers". Purdue University. Retrieved 2018-03-12. See also: "The Frank and Lillian Gilbreth Library of Management: The N-File". Purdue University Libraries. Archived from the original on 2011-03-07. Retrieved 2011-04-16. ^ "Collection of Materials Related to Lillian Gilbreth". Purdue University. Retrieved 2018-03-12. See also: "The Frank and Lillian Gilbreth Films Collection". Purdue University. Retrieved 2018-03-12. ^ Kass-Simon and Farnes, eds., p. 162. ^ a b "National Academy of Engineering Armstrong Endowment for Young Engineers - Gilbreth Lectures". National Academy of Engineering. April 2011. ^ "The Frank and Lillian Gilbreth Industrial Engineering Award". Institute of Industrial Engineers. Retrieved 2011-04-16. ^ "Purdue College of Engineering -- Distinguished Professors". Purdue University. Retrieved 2011-04-16. ^ "SWE - Undergraduate Scholarships". Society of Women Engineers. Retrieved 2011-04-16. ^ Weber, p. 45. See also: "Cheaper by the Dozen (1950)". IMDb. Retrieved 2018-03-14. Also: "Belles on their Toes (1952)". IMDb. Retrieved 2018-03-14. ^ "Lillian Gilbreth Postdoctoral Fellowships at Purdue Engineering". Purdue University. Retrieved 2019-03-12. ^ "American Women: A selection from the National Portrait Gallery - Lillian Moller Gilbreth". National Portrait Gallery. Archived from the original on 2010-06-13. Retrieved 2011-04-16. ^ Kass-Simon and Farnes, eds., p. 159. ^ a b "The Woman Engineer". www.theiet.org. Retrieved 2018-11-06. ^ a b Graham (1998), p. 105. ^ a b "The SWE Story... timeline of achievement". Society of Women Engineers. ^ "Alumnus/a of the Year Recipients". Cal Alumni Association. Retrieved 2011-04-23. ^ Finken, De Anne (Spring 2005). "Lillian Moller Gilbreth, Ph.D.: A Legend in her own time - and now!" (PDF). SWE Magazine. Society of Women Engineers. pp. 16–22. Retrieved 2011-04-15. ^ The Hoover Medal, an engineering prize awarded jointly by five engineering societies, was awarded to Gilbreth for her "contributions to motion study and to the recognition of the principle that management engineering and human relations are intertwined" and "her unselfish application of energy and creative efforts in modifying industrial and home environments for the handicapped has resulted in full employment of their capabilities and elevation of their self-esteem". See "ASME - Past Hoover Medal Recipients". American Society of Mechanical Engineers. Retrieved 2018-03-13. ^ "Women On Stamps - Publication 512". United States Postal Service. April 2003. Archived from the original on 2006-04-28. ^ Although the American Psychological Association identified Gilbreth as the first psychologist to be so commemorated, psychologists Gary Brucato Jr. and John D. Hogan later questioned this claim, noting that John Dewey had appeared on an American stamp in 1968, seventeen years earlier; however, Brocato and Hogan also emphasized that Gilbreth was the first female psychologist to be so honored. See: Brucato Jr., Gary; John D. Hogan (Spring 1999). "Psychologists on postage stamps". The General Psychologist. 34 (1): 65. A comprehensive international list of psychologists on stamps (compiled by psychology historian Ludy T. Benjamin) indicates that Gilbreth was the second female psychologist commemorated by a postage stamp in all the world, preceded only by Maria Montessori in India in 1970. See Benjamin, Ludy T. (2003). "Why Can't Psychology Get a Stamp?". Journal of applied psychoanalytic studies. 5 (4): 443–454. ^ a b c d Weber, p. 41. ^ Frank Bunker Gilbreth; Lillian Moller Gilbreth (1916). Fatigue Study: The Elimination of Humanity's Greatest Unnecessary Waste: A First Step in Motion Study. Sturgis and Walton Company. Graham, Laurel D. (1998). Managing On Her Own: Dr. Lillian Gilbreth and Women's Work in the Interwar Era. Norcross, Georgia: Engineering & Management Press. ISBN 978-0-89806-185-7. Graham, Laurel D (1994). "Critical Biography Without Subjects and Objects: An Encounter with Dr. Lillian Moller Gilbreth". The Sociological Quarterly. 35: 621–643. doi:10.1111/j.1533-8525.1994.tb00420.x. Lancaster, Jane (2004). Making Time: Lillian Moller Gilbreth, A Life Beyond "Cheaper by the Dozen". Northeastern University Press. ISBN 978-1-55553-612-1. Lancaster, Jane (February 1996). "O Pioneer". Brown Alumni Monthly. 96 (5). Retrieved 2002-09-23. Sullivan, Sherry (1995). "Management's Unsung Theorist: An Examination of the Works of Lillian M. Gilbreth". Biography. 18: 31–41. doi:10.1353/bio.2010.0256. Weber, Catherine E. Forrest (Summer 1997). "Dr. Lillian Gilbreth and the One Best Way". Traces of Indiana and Midwestern History. Indianapolis: Indiana Historical Society. 9 (3): 38–45. Wood, Michael C. (2003). Frank and Lillian Gilbreth: Critical Evaluations in Business and Management. 1. Routledge. ISBN 978-0-415-30946-2. Yost, Edna (1949). Frank and Lillian Gilbreth, Partners for Life. Piscataway, New Jersey: Rutgers University Press. Yost, Edna, "Lillian Moller Gilbreth" in American Women in Science. Philadelphia: Frederick A. Stokes. 1943. Wikimedia Commons has media related to Lillian Moller Gilbreth. "The Gilbreths: An Extraordinary American Family". , comprehensive family and professional history.